Imagine a modern urban city, like New York, with tall luxury glass towers rising up into the blue sky (looks a lot like Dubai), each tower more beautiful then the next. But, unlike New York City, this modern city is located in a tropical paradise on aqua blue and green oceans, white sandy beaches. and air temperatures that range between 75-85 degrees in the winter. There are 2 of these urban cities in Miami-Dade County, and they are connected to each other by a small causeway. These cities are named Aventura and Sunny Isles. Aventura is located on Biscayne Bay just north of Miami. This city of contemporary, high-rise luxury doorman condominiums, was first developed in the 1960’s as a densely populated urban paradise built on the wide bay. Thus, many of the waterfront buildings have marinas and the area is a boater’s dream. Aventura, which is the Spanish word for “adventure,” is a perfect name for this city. The city is built around the Turnberry golf course, one the country’s finest golf courses. The jewel of Aventura is the world famous Aventura Mall. This is the 5th largest shopping mall in the United States (over 2,800,000 sf of retail space), making this city a shopping mecca. You could spend 2 full days in the Aventura mall and still not visit all the shops. Anchor stores include Macy’s, Nordstrom, Bloomingdale’s, J.C. Penney, and an AMC 24 movie theatre complex. This fully air-conditioned, 3 story mall also includes a large food court, individual restaurants such as The Cheesecake Factory, and many smaller shops and kiosks. Residents say that if you cannot find it in Aventura mall, it does not exist. One very appealing feature of Aventura is that the city runs a free shuttle service that will pick you up at your building or hotel and take you to the mall and other locations within the city, all at no charge. Another wonderful feature in Aventura is Aventura Hospital. Aventura Hospital is one of the finest medical facilities in South Florida, specializing in diagnostic, medical, surgical, cancer and cardiovascular diseases. It is a beautifully modern facility, and most wings of the hospital have only private rooms. Located in Aventura, this hospital attracts the best medical personnel. Aventura also attracts very sophisticated homeowners. Famous for its large Jewish population from the northeastern U.S. (NY, NJ, PA, MA ), the city also enjoys a large population from Brazil, Columbia, Israel, Venezuela and Russia. Schools that service Aventura are K-8 schools, including the Dr. Michael Krop High School. Aventura is located in between the Miami Airport (40-minute drive south) and the Fort Lauderdale Airport (30-minute drive north). Condominium homes range in price from $200K – $15 million. There are units for every budget. There are also townhouse complexes and private, single-family homes. As an example, Aventura Lakes is a gated, newer community of single-family homes with every home built on a canal and is called ” little Venice.” These homes start at $850,000. The community has a clubhouse with a large gym and heated swimming pool. Take a short drive on the causeway across the bay (intra-coastal waterway), and you arrive in Sunny Isles. When this city was incorporated, it was going to be named ” Aventura Beach,” however, the name ended up being Sunny Isles. 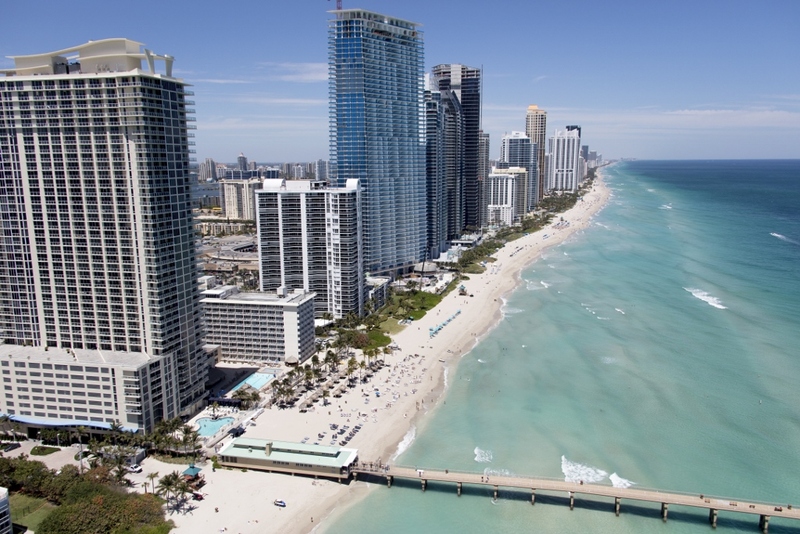 Sunny Isles is a glittering city of high rises located on the barrier reef island just north of Miami Beach. This is a city built right on the white sandy beaches of the Atlantic, with views of aqua blue and aqua green water. The city has an amazing modern architecture with 45 story condominium towers that fit every buyer’s fantasies. The Porsche building has condo owners driving their cars into elevators and riding up to their condo with their car, which is parked inside their unit. Thus, you can have you car on the 35th floor inside your condo unit! Most of these buildings were built in 2000 or more recently. There are 4 Trump tower buildings on Sunny Isles. Condominium homes are built on both sides of Collins Avenue, so you can choose to be on the intra-coastal bay with your boat in your marina or you can choose an oceanfront view.